Update (5:15 pm ET): After picking up steam immediately ahead of landfall, Michael has been downgraded to a Category 3 storm, and its eye is now approaching southeastern Alabama and southwestern Georgia. The storm is moving at a brisk 16 mph with a max windspeed of 125 mph. ...As well as life threatening flash flooding. Here's a satellite view of the storm as it moves inland. Meanwhile, videos of the devastation caused by Michael's deadly storm surge are beginning to circulate on Twitter. The following video was taken on Cook St. on St. George Island, a town in located in Franklin County, and shows a home completely submerged as the town appears to have sunken into the sea. Update (3:30 pm ET): Michael's winds have slowed only slightly (max windspeeds have fallen to about 140 mph) as the eye of the storm has moved decisively ashore, and eyewall - the most dangerous part of the storm - has moved on from Bay County to Jackson County as the storm moves inland and approaches I-10. Water levels in Apalachicola Florida have climbed to 7.72 feet above high tide, breaking a record set by Hurricane Dennis in 2005. FEMA gave a joint briefing with President Trump shortly before Michael made landfall on Wednesday. And now the Department of Defense is giving a briefing of its own. Florida Gov. Rick Scott declared that "Hurricane Michael is upon us". And as the New York Times added, for those who lingered a little too long, the time to evacuate has now passed. Instead, everybody remaining in the evacuation zones is being advised to hunker down and say a few prayers. The mandatory evacuation zone in Florida encompassed some 375,000 residents - but it's not clear how many chose to leave. States of emergency have been declared in parts of five states - Florida, Georgia, Alabama, North Carolina and South Carolina - affecting some 12 million people. Compared with Florence, Michael is moving at a relatively swift 15 mph, and is already beginning to hammer parts of southern Georgia. Roughly 4,000 people slept in storm shelters last night, according to the Red Cross. Already, 80,000 power customers have lost service, and floodwaters have overtaken some homes in Mexico Beach, where the hurricane first came ashore. Just about every update seemed to bring greater grimness: closed bridges, more towering waves, suspended emergency services, admonitions that the time to evacuate had passed. The hurricane center reported a 130-mile-per-hour wind gust near the evacuated Tyndall Air Force Base — and said that the measuring instrument had then failed. Even the journalists are too afraid to venture outside. One NYT reporter tweeted the following photo showing himself and his fellow hotel guests gathered in a windowless basement room as the hotel "shudders like an LA Earthquake." Those brave enough to venture outside are depicting scenes of utter chaos. The storm is the most powerful hurricane to ever hit the Florida Panhandle. The catastrophic damage expected will likely knock out power in Bay County and further inland to Tallahassee and southern Georgia, Axios said. Videos of the eyewall smashing into Panama City Beach proliferated on social media. Meteorologists have been stunned by Michael's apparent determination to strike land with as much force as possible. As recently as Monday, scientists anticipated that the storm would hit the coast with Category 3 force winds, or slower. But the fact that Michael is battering the Florida panhandle coastline with 155 mph - just 2 mph shy of Category 5 - has left many scientists slackjawed. As one meteorologist said on twitter, "never in my worst nightmares did I think we would be dealing with a 155 mph hurricane." So how did this happen? As Axios explains, Michael faced a few obstacles when it first formed off the coast of Cuba, including "wind shear", a wind pattern that helps blunt the force of storm's winds. But the storm was able to overcome them because it had the rest of the ingredients needed for rapid intensification: Plenty of warm water, moist air, and an upper level wind pattern over the northeast Gulf of Mexico that helped recycle some of the wind pushed upward by the wind shear. In other words, it was "the perfect storm." Update (1 pm ET): The NHC has published the latest positioning update on Hurricane Michael. The storm, now about 20 miles from the Florida coast, is expected to make landfall between Panama City and St. Vincent. As the eyewall of the storm approaches Panama City, one intrepid reporter offered a glimpse into the mayhem. Update (12 pm ET): Now just 40 miles from Panama City, Hurricane Michael is still gaining strength as it approaches the Florida panhandle. The storm has apparently exceeded the expectations from the National Weather Service, which warned that it is a "worst case scenario" and will cause unprecedented devastation to the communities in its path. Meanwhile, the NWS' Tallahassee office said it issued its first ever "extreme win warning" for parts of Bay County that will soon be experiencing gusts of more than 130 mph. President Trump tweeted satellite imagery showing just how powerful the storm has become as it approaches the Florida coast, along with a message of support. Meanwhile, scientists warned that Michael could strengthen into a Category 5 Hurricane before making landfall, as its maximum wind speeds of 150 mph were just 7 mph shy of the most dangerous category of hurricane, per USA Today. One thing's for sure: Michael isn't slowing down. Update (9 am ET): Hurricane Michael continued to strengthen Wednesday morning, as the Category 4 storm's wind speed increased to 145 mph. The storm is now poised to be the strongest to hit the US in 14 years, boasting a life threatening storm surge and the potential to cause $16 billion in damages. The storm is now roughly 90 miles southwest of Panama City and is heading north at 13 miles per hour, according to the NHC's latest update. The storm's outer bands are already battering the coastal town of Apalachicola with winds of nearly 50 mph. As it stands, the storm is also poised to be the strongest to hit the Florida panhandle and big bend since meteorologists first started gathering data. Regional ports have closed in anticipation, and more than 230 flights have been canceled. Duke Energy Corp., a utility that supplies electricity to the region, expects more than 200,000 customers in the state will be without power. In preparation for the widespread outages, local utilities have about 19,000 workers on stand by ready to work to quickly restore power, with more workers pouring in from out of state. Still, some areas are expected to be without power for more than a week, per the Daily Commercial. "A storm like this could be a once-in-a-lifetime event," said Brett Rathbun, a meteorologist with AccuWeather Inc. in State College, Pennsylvania. "Winds of this intensity can really knock down any tree or structure in its path." There are also 3,500 National Guard members, 1,000 rescue workers and 3,000 FEMA employees in the area ready to aid in the response. Michael is whipping up waves as high as 30 feet in the Gulf and could bring a 14-foot surge and 4 to 8 inches of rain, with some isolated areas getting as much as 12 inches. As one meteorologist pointed out, the barometric pressure of the storm system has continued to drop, and only four hurricanes have ever made landfall in the Continental US with a lower pressure reading. As residents of the Florida panhandle and big bend scrambled to flee their homes, Hurricane Michael strengthened to a Category 4 Hurricane overnight, putting it on track to rival the strongest storms to ever make landfall in that part of the country. As one meteorologist pointed out, if Michael doesn't weaken before making landfall late Wednesday, it would surpass Hurricane Eloise, which wrecked the panhandle in 1975, and the Pensacola Hurricane of 1882 for strongest winds ever recorded for a landfall in the panhandle. If the storm's 140 mph+ wind speeds are maintained, Michael could be the strongest storm to hit the area since the dawn of record-keeping in 1851. While Florida residents are somewhat accustomed to record-breaking storms, according to the Weather Channel, "no long-time residents of this area will have seen a hurricane this strong before." Stores in the region have started rationing supplies like water and generators as residents have scrambled to stock up while state of emergencies have been issued in Florida and Alabama. The National Weather Service described the storm as "extremely dangerous." Hurricane warnings are in effect for the Florida Gulf Coast from the Alabama-Florida border to Suwanee River, Fla. This includes Pensacola, Panama City, Destin and Tallahassee. Warnings also extend inland to southwestern Georgia, including Albany. Hurricane Warnings are issued a day-and-a-half before the anticipated arrival of tropical storm force winds. Nearly 4 million people live in these areas, while another 8.5 million live in areas facing tropical storm warnings. Emergency officials in Bay County, Florida - where Michael is expected to make landfall - said they are already witnessing deteriorating conditions due to the storm. ...and issued mandatory or voluntary evacuation orders in at least 22 counties on the Florida Gulf Coast. Scott also extended a state of emergency to 35 counties and activated 2,500 National Guardsmen. Georgia and Alabama have also declared states of emergency. "Hurricane Michael is forecast to be the most destructive storm to hit the Florida Panhandle in decades," Scott said. "You cannot hide from storm surge, so get out if an evacuation is ordered," per CNN. Along the North Florida coastline, the extreme danger will be storm surge. Gulf water will be pushed over the land at extreme depths - perhaps 10 feet or more - to the right of where the center comes ashore. "It will not be survivable in the affected coastal locations", according to ABC's Local 10 news. A storm surge warning is in effect for much of the panhandle and big bend, where waves could measure between 9 to 13 feet above ground level, causing land along the coast to sink into the ocean as water climbs "over the roofs of houses," Scott said. President Trump has approved a pre-landfall emergency declaration to offer federal money to affected areas. Tropical storm warnings are in effect from the Alabama/Florida border westward to the Mississippi/Alabama border, from Suwannee River, Florida, southward to Chassahowitzka, Florida, and along the Southeast coast from Fernandina Beach, Florida, to Surf City, North Carolina. The tropical storm warning also extends inland to portions of southern Alabama and southwestern Georgia, including Mobile, Alabama, and Valdosta, Georgia. This means tropical-storm-force winds are expected somewhere within the warning area within 36 hours. Tropical storm watches have been posted from Chassahowitzka, Florida, to Anna Maria Island, Florida, including Tampa Bay, from the Mississippi/Alabama border westward to the mouth of the Pearl River and also along the Southeast coast from South Santee River, South Carolina, to Duck, North Carolina, including Pamlico and Albemarle sounds. This means tropical-storm-force winds are possible within 48 hours. Already, hurricane strength winds have started whipping the panhandle, forcing the National Weather Service has issued a tornado watch. Closer to the center of the storm, which is now within 120 miles of Panama City, Fla., meteorologists have measured winds of more than 140 mph. Between Tyndall Air Force Base and Keaton Beach, heavy rainfall is expected across a large portion of the southeastern US along Michael's track, with the rains expected to stretch well inland. Meanwhile, storm surge watches, which means life-threatening surges remain a possibility, are in effect from Anclote River to Anna Maria Island, as well as Tampa Bay. Michael is expected to inundate a large portion of the southeastern US with rain, with up to 12 inches falling in the panhandle and big bend, as well as southeastern Alabama and southern Georgia. Some parts of the Carolinas, which are still recovering from Hurricane Florence, and southern Virginia could endure up to six inches of rain. ...As the storm moves inland this week. Residents and business that are within the areas under mandatory evacuation order have only "a few precious hours" left to prepare before the storm's landfall. Most customers in the hurricane's path will likely lose power during the storm, and utilities aren't certain how long it will take for power to be restored. Outages may extend into east Georgia, southeastern Alabama, the Lowcountry of South Carolina and southeast North Carolina given Michael's faster movement. The storm's outer bands have already soaked parts of the Florida Keys. To put Michael in context, only three Category 3 or higher storms have struck the Panhandle since 1950: Eloise in 1975, Opal in 1995 and Dennis in 2005. 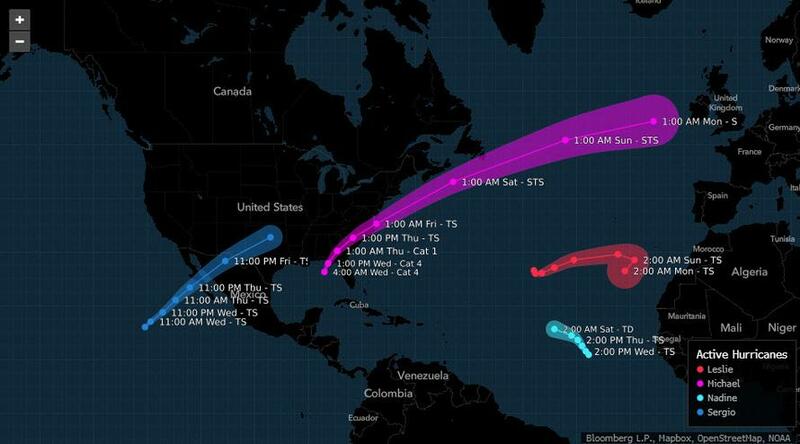 Six airports in the Florida panhandle have closed ahead of the storm, while 40% of oil production in the Gulf has been shuttered ahead of the storm, helping to keep WTI crude prices elevated around $75 a barrel, as Michael has become "the top concern for the oil market this week," per one analyst.